Emily Bender is a recent (May 2018) Bridgewater College graduate with a B.S in Environmental Science. She is excited to be joining the VCC team as the Stewardship and Outreach Coordinator after serving for several months as an intern. Emily and her husband, Jeremy, enjoy living in Mount Crawford. Emily grew up attending summer camp at Camp Bethel (in Fincastle, VA) and worked as a part of their staff for several summers. 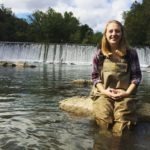 This experience was one that shaped her love of the outdoors and determined her educational path in Environmental Science. She hopes to spend her weekends hiking and working on a garden once she is settled into her new house.